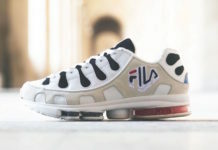 FILA cuts the cords to their brakes as they continue to cruise with collaborative releases. 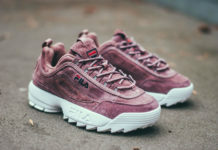 Today, we take a look at their latest, the Lafayette x FILA 93 Overpass Pack that includes two different colorways to choose from. FILA and NYC streetwear brand Lafayette use the Overpass runner and covers it with a camouflage print in either White or Green color tones. Lafayette’s logo appears on the quarter panel, while FILA stamps their approval on the tongues. Look for the Lafayette x FILA 93 Overpass Pack to release on Saturday, June 24th, exclusively at Privilege’s brick and mortar. All shoes leftover will be sold online via pvlgnyc.com.